From experience I know cutting too many patches and strips in one session leaves my hands sore. The repetitive motion of the task causes it. So, hand health becomes really important, particularly as we get older. We’ve learned that using a rotary cutter reduces a lot of the soreness. Selecting the right one for the task can reduce even more soreness, as it meets our cutting needs. Rotary cutters come in many colors, shapes and styles, and types of blades, to match handling the cutter with cutting fabric. Here is a guide for selecting one of the most commonly used rotary cutters for a quilting project. 18mm Rotary Cutter: Use it to cut curved quilt pieces and templates, or to trim seams. 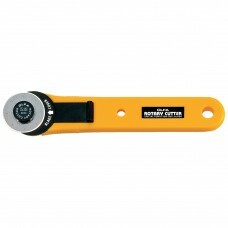 The OLFA 18mm rotary cutter includes a quick blade change handle. 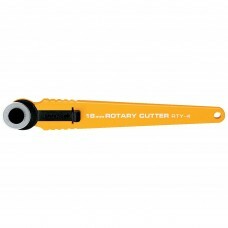 28mm Rotary Cutter: This cutter is perfect for small-scale projects, miniatures and tight corners. 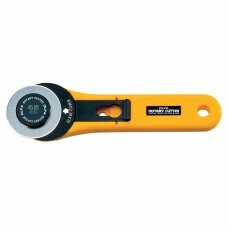 The OLFA 28mm rotary cutter includes a quick blade change handle. 45mm Rotary Cutter: The cutter is a rolling razor blade used to cut materials into shapes, strips and pieces for sewing, quilting and craft projects. The OLFA 45mm rotary cutter is available with a quick a blade change handle, straight handle or ergonomic handle and cuts up to 8 layers of cotton fabric. 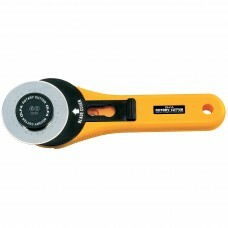 60mm Rotary Cutter: Ideal for medium to heavy-duty projects, this cutter can accommodate up to eight layers of fabric. The OLFA 60mm rotary cutter is available with a straight handle or ergonomic handle and cuts up to 12 layers of cotton fabric. You know, it’s amazing the role cutting mats, rulers and rotary cutters play in making a quilt—more than any quilter probably even thinks about. We pick a quilt design, buy the fabric and just start cutting, with these wonderful fabric cutting tools at the ready in the background, ready to pull out to do their thing. How lucky we are to have them help us with the work of quilting!